Litchfield County, Connecticut, October 15, 2005 - After nine straight days of rain in NYC - and not just a Seattle-type drizzle, we're talking an average of nearly two inches of rain every day - the sun finally came out as we drove up to Connecticut Saturday morning to spend the weekend with our neighbors at their vacation home. 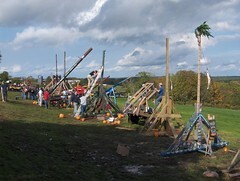 And what better way to celebrate the end of the rain than by watching a good ol' pumpkin-catapulting competition? A wealthy farmer donated food, drink, and a field, and hundreds of spectators gathered to cheer on everything from kid-built overgrown slingshots to giant air-cannons that launched pumpkins into low-earth orbit. At some point during the festivities, the question was asked: "Who first thought of doing this?" I don't know, but I am certain - and Dave Barry would probably agree - that whoever it was, he was 1) a guy, 2) a genius, and 3) at least halfway through a six-pack.